Posted on February 5, 2015 by No Map Required Posted in Ecuador, Places	. Today we got a sweet, sweet surprise! At the beginning of our Mongolian Horse Training Trek (i.e. our fourth time on a horse, for those who are counting) we passed this most amazing site! 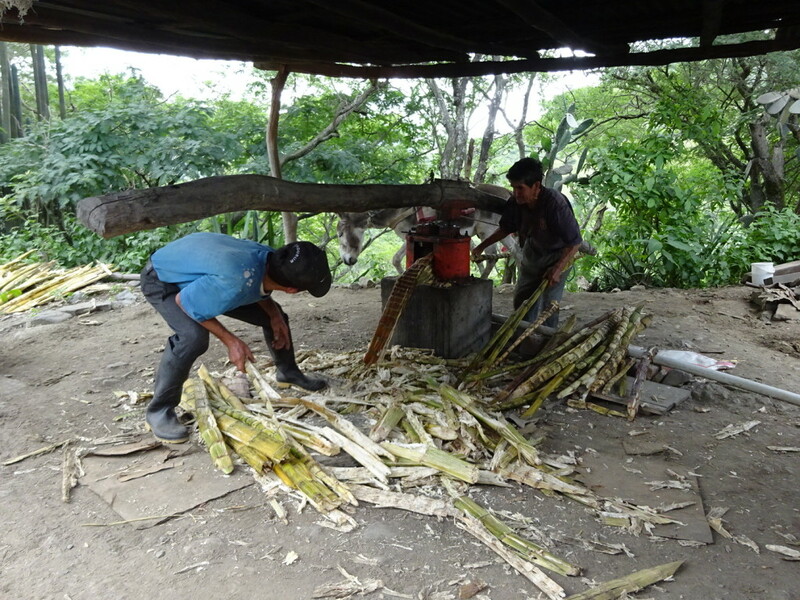 As a little three legged dog yapped at us, guarding a little house and shelter, our guide told Aaron that they are pressing sugar cane. When Aaron relayed that information the guide most have seen the sparkle in our eyes, because he turned the horses around and we got to have a field trip! 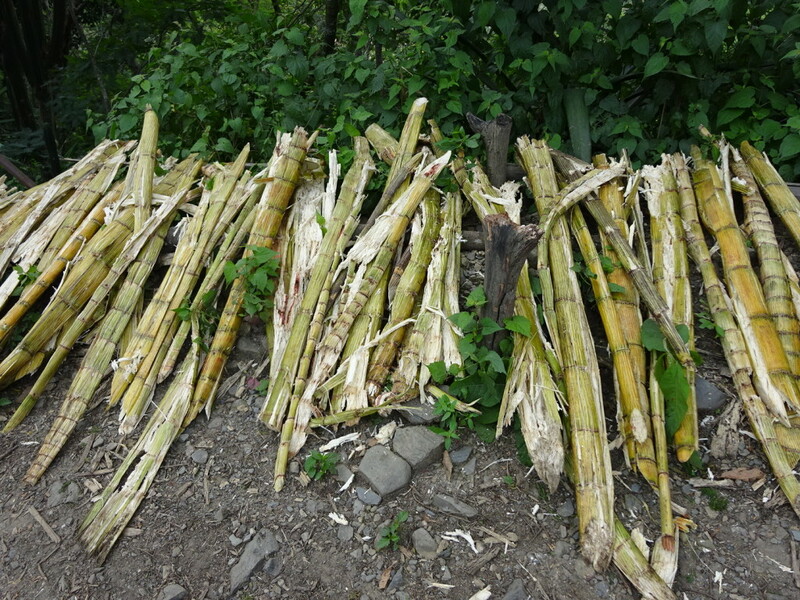 Sugar cane that was picked yesterday and will be pressed today. The two men are brothers – both short to start with but also a bit hunched. Federico, in the blue shirt, keeps the donkey walking in circles while Bartolome feeds canes into the press. The machine must be fed! Duuuck! 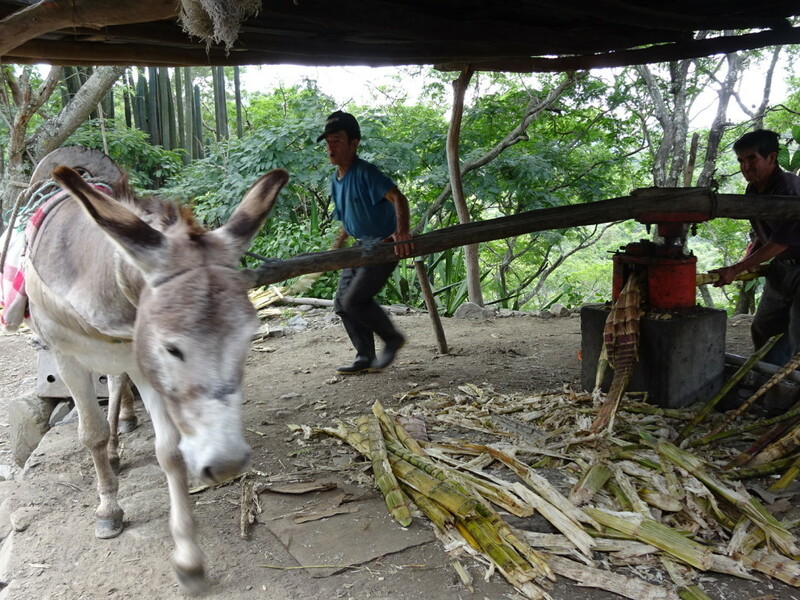 Here is a picture of the operation: The donkey pulls the giant stick. The stick turns the press. The sugar cane is fed through the press. The juice drains into a the white pvc pipe on the right and down into a red bucket (not shown here). 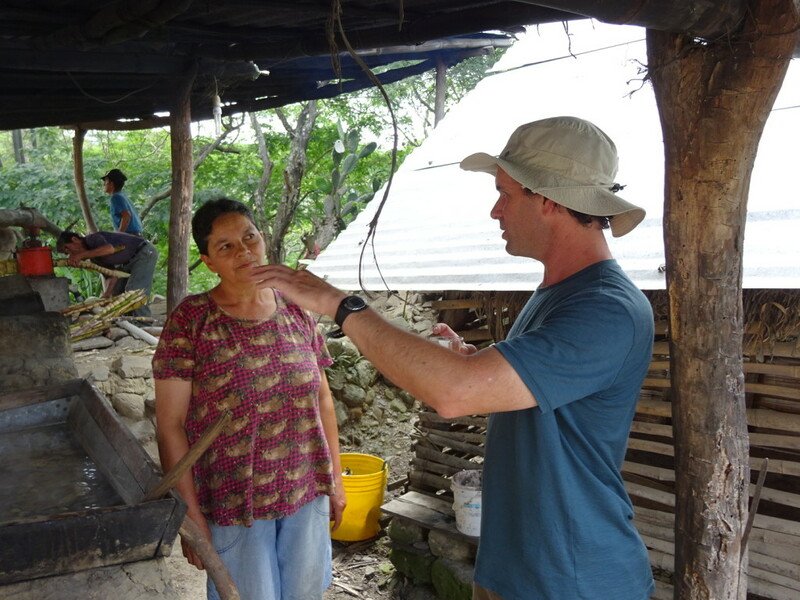 Talking with Bartolome’s wife, Inez. She cooks down the juice from the sugar cane. On the right you can see the big red bucket…there is a pipe that goes from the press into this bucket. It fills up every 2-3 hours. 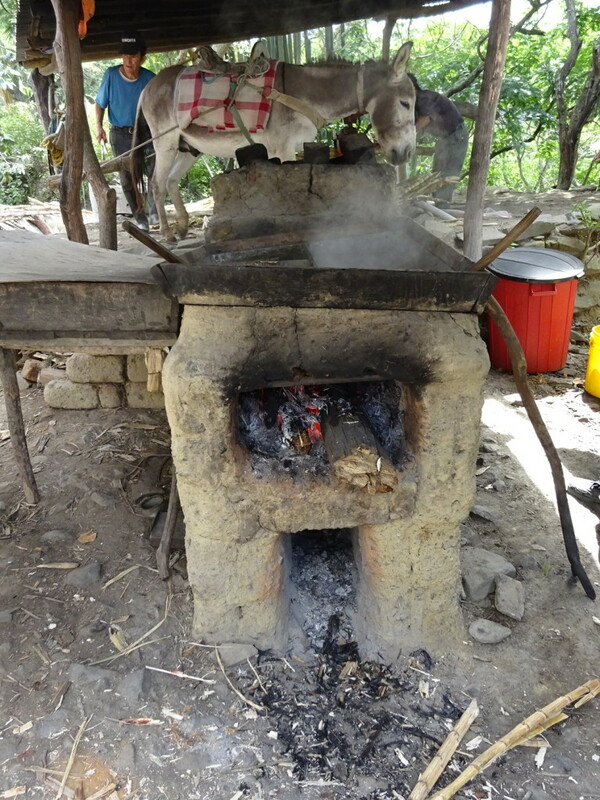 In the foreground you can see a fire cooking and heating the cane juice above so it concentrates into a sort of honey. The fire is a fine way to use up the spent canes. A glass full of sugary goodness! What’s not to love? It has an earthy, woody taste at this stage, but make no mistake about it: it’s 100% natural and delicious! The sugar cane is cooked down and down until it is cooled and cut into blocks for sale. We were able to taste it at a stage where it’s a lot like honey, and every bit as good as that sounds! What a great adventure! It’s one of those things we had no idea we were going to see and then it’s such a treat when it happens. Man, I love this trip! 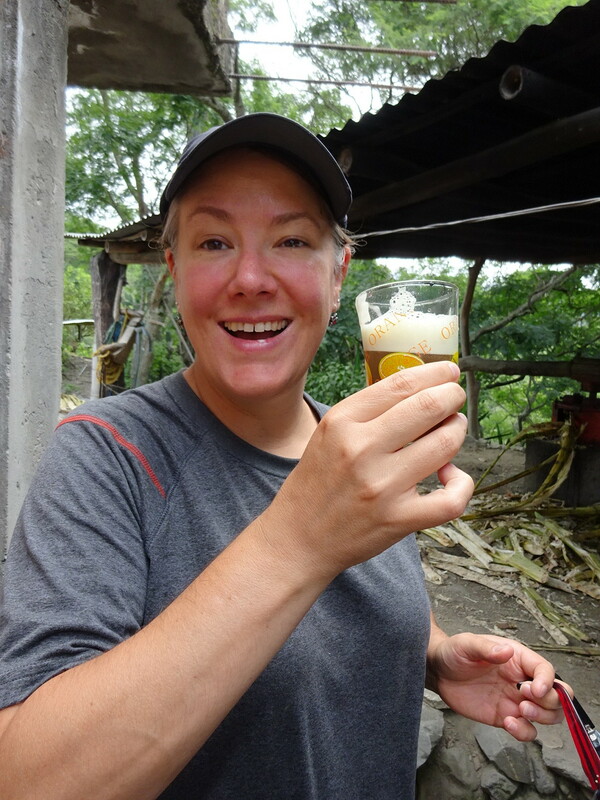 « Homestay with an indigenous family in Namarín! Aaron says I sparkle all the time. 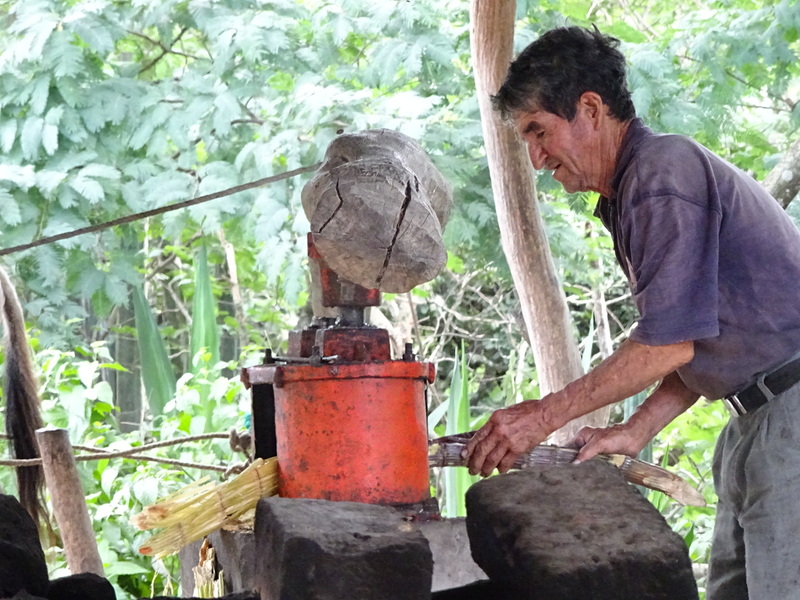 I have seen a cane press like this one…..on the outskirts of a little town in south Georgia, years ago. Donkey included. Oh! I can totally picture that scene in the Georgia Mountain Fair. We saw the same operation, with donkey, in the Galapolos.